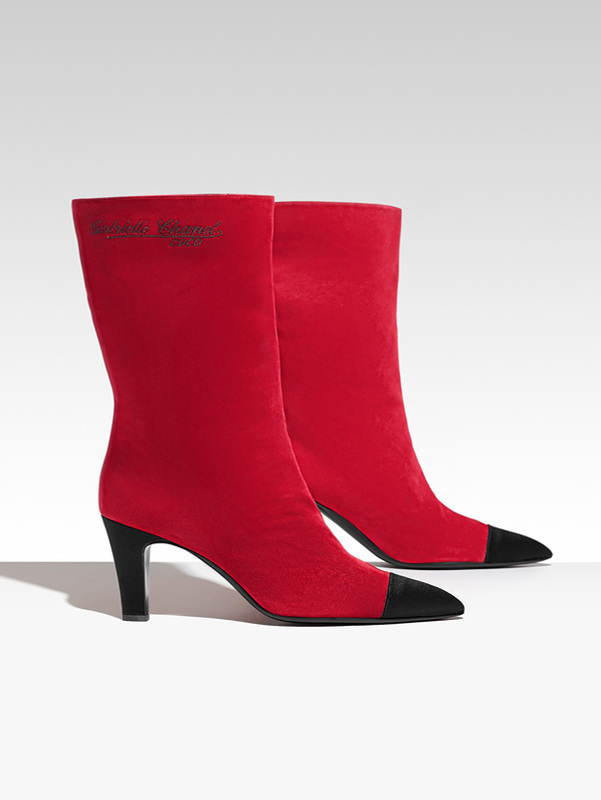 Since his arrival at Chanel in 1983, Karl Lagerfeld has regularly featured boots in his collections, drawing on a key element from Gabrielle Chanel’s own wardrobe. For although she never included them in her collections, she wore them herself in all kinds of situations. And what footwear could be more perfect for this lover of horses, accomplished rider and racecourse enthusiast? In the 1920s at Eaton Hall, the home of the Duke of Westminster, she would go riding and then wear boots to stroll around the castle grounds. From then on Mademoiselle would make them her companions in the countryside as much as in the city. From 1958 she would wear her tweed suits with boots and she enjoyed seeing her favourite model, Marie-Hélène Arnaud, sporting them too. In 1966 Women’s Wear Daily discussed her “motorcycle boots”, produced by Massaro, who in order to give them more flexibility, cut them from a felt that was exclusively blue, almost black, or sometimes white and blue. “My ankles swell a little and with these boots, you can’t see a thing! One day we’ll do them for the collection,” Gabrielle Chanel confided in Raymond Massaro. 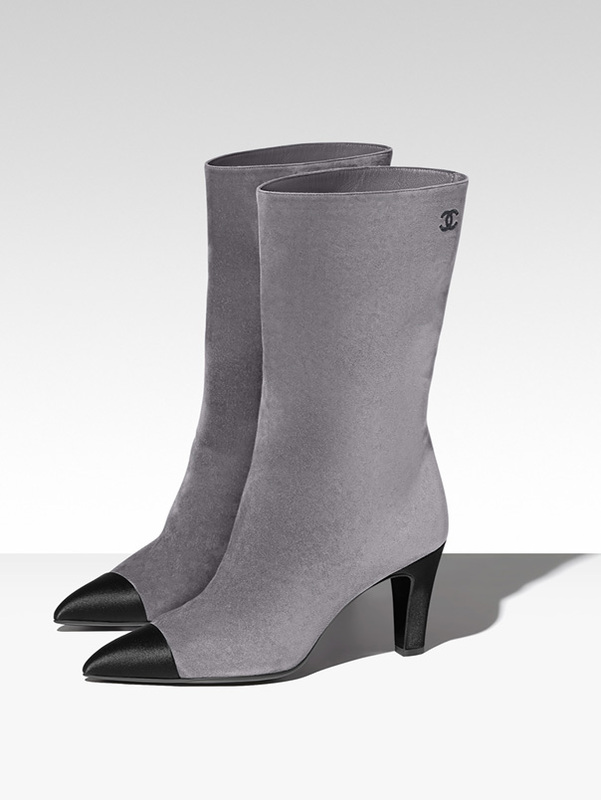 While the boots remained reserved for her own daily life, Karl Lagerfeld has honoured them regularly over the seasons. Chained, laced up to the knee, embroidered, embellished with bows or grosgrain ribbons… season after season, the boots express all aspects of Karl Lagerfeld’s creativity. For the autumn/winter 2017/18 pre-collection, the Chanel boot adopts an urban look. Two-tone and ultra-chic, it steps out in suede and satin. Elegant and comfortable, it stops prudently at mid-calf. At this point the signature Gabrielle Chanel, subtitled Coco, appears engraved in the skin. A sophistication emphasised by the colour duos: the satin toe cap, always black, is accompanied by a suede calfskin in beige, teal, burgundy, midnight or royal blue, aubergine, deep or brick red and grey. Just one exception punctuates the line as a monochrome black version. Karl Lagerfeld pursues the metamorphosis of the Chanel boot with the autumn/winter 2017/18 Ready-to- Wear collection. It is ready to conquer outer space on a low, slightly bevelled square heel. Its squared toecap is swathed in patent leather or Lurex while its sparkling fabric shimmers like a constellation of diamonds in the Chanel galaxy. 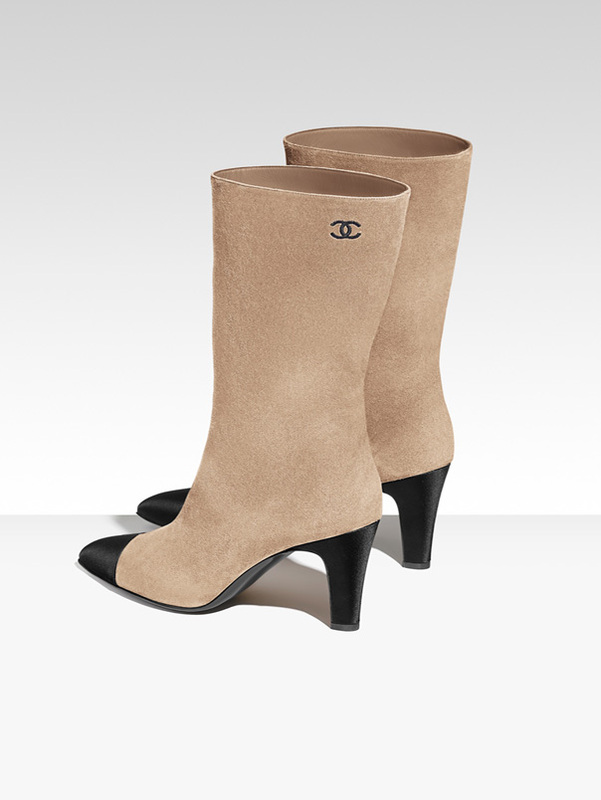 Whether understated or elaborate, the Chanel boot carries within it all the precision of a line as well as a timeless allure.